(Prison Planet) A video from last night’s protest outside the Supreme Court shows two liberals being triggered into literal screaming fits by a man reading out the Constitution. A conservative with a bullhorn begins reading out passages from the Constitution before making the point that nowhere does it mention abortion or Roe v Wade. This prompts two nearby leftists to literally break out in fits of rage, yelling in his ear for almost two minutes straight. 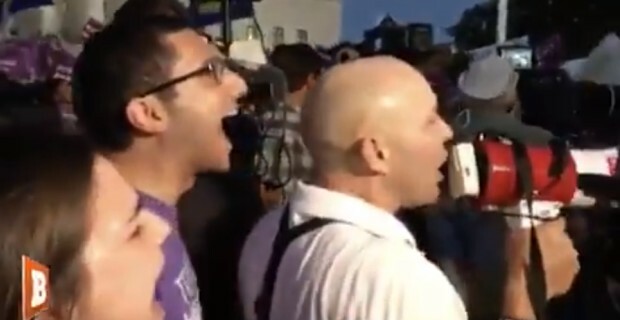 At one stage the screaming man loses his voice and has to take a moment to recover. “This is how much the left hates freedom of speech, the absolute state of the Resistance,” commented Breitbart, who posted the video on Twitter. The scenes are reminiscent of the two separate occasions when leftists literally organized events called “scream helplessly at the sky” during which large crowds of them wailed into the wind for no discernible reason. As we reported earlier, this was about as much energy as leftists could muster during the protest, which was sparsely attended. According to conservative comedian Tim Young who attended the demonstration, about 300 people showed up. Those who chose not to engage in loud screaming hissy fits in reaction to Trump’s Supreme Court pick chose to do the text version on Twitter instead.